A couple of days have passed and I am still riding the high of last Sunday’s Cherry Blossom 10 Miler. It was a crazy day and I’m happy to say that despite the wind, I had a great race! I’m linking up with Erika, Marcia, and Patty for Tuesdays on the Run. The theme this week is to use one word to describe your running lately. After this past race, all I can say is that lately my running has been AMAZING. 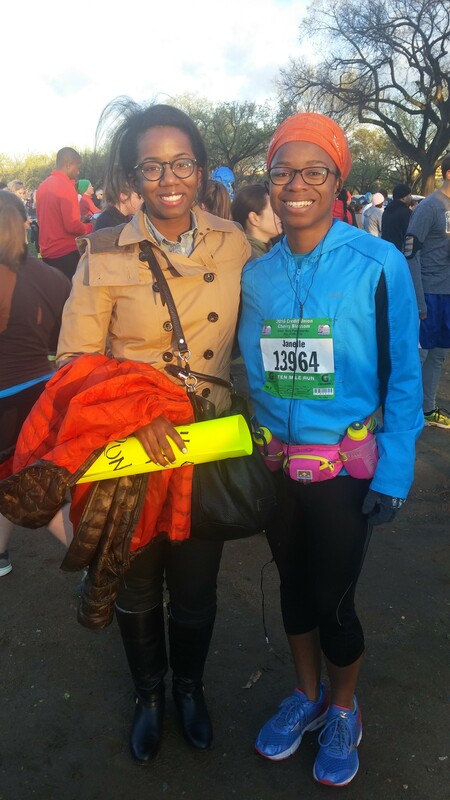 Keep reading to get the full scoop on the Cherry Blossom 10 Miler! 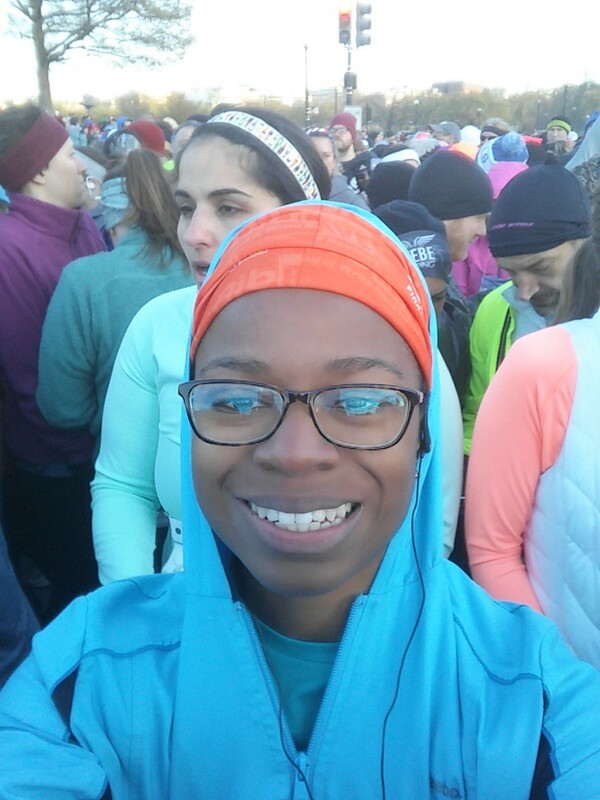 The Cherry Blossom Run was my first big race of 2016. Training began at the end of January, and over the past couple of months, I ran through it all: snow, rain, extreme cold, and even temperatures in the 70’s. I always wonder if the hard work will really manifest itself when it matters. I”m so grateful to say that this was that race. I’ve been a Social Runner for Cherry Blossom this year, so I was lucky to be thrown the red carpet for race weekend. I was comped a hotel stay at the Hyatt Capitol Hill for the weekend, not too far from the race start. Bret and I drove down from work on Friday and got to DC from Philly in about 3.5 hours. We had a late dinner at Ambar, all you can eat and drink, and it was fantastic! My pictures didn’t come out well but trust me…we ate well. I visited this spot a few years ago with my sister for brunch and it was great then! Time went fast on Saturday and in the evening I had invitations to the VIP Prerace Dinner, with Bret as my +1. This was the opportunity to finally meet the bloggers that I’ve been working with the past few months and to celebrate the end of a really fun season. It was so nice to finally meet Coco and Lauren, to see Courtney again, and meet Molly, Kim, Liz, and Tai. They were a lot of fun! I also really appreciated the encouragement they gave me since I was nervous about the race due to the weather. The Social Runners team! We clean up nice! We had a great dinner and presentation by the race organizers and Mr. Meb himself went up and gave a speech! Very cool! The Credit Union Cherry Blossom Run raised over $7.5 million for the Children’s Miracle Network Hospitals. I was happy to fundraise $395 towards the cause, thanks to my supporters! While having dinner, we were getting updates on the Villanova men’s basketball game vs. Oklahoma. I was a little nervous about the outcome until I found out they were up by 40 points! I couldn’t believe it! And spoiler alert, the Wildcats took care of business on Monday night and won the championship in the most amazing buzzer-beater I’ve ever seen! I went to Villanova for grad school, so I am claiming this win (plus I love Archie aka Ryan Arcidiacono). The city of Philadelphia will be a little bit happier for the next few days! The alarm was set for 5:30 am. Staying in a hotel, I didn’t really think about how the logistics are a bit different from rolling out of bed for a race. The race started at 7:30, and because of the wind we didn’t want to head out there too soon. I was still unsure of what to wear, even though I laid out most of my clothing. I brought my windbreaker to wear over my long-sleeved shirt and thankfully had a pair of gloves in the pockets! I was nervous about which socks to wear because I had some blister issues during the Rock N Roll DC half marathon around mile 9. I decided to go with my Feetures socks. Wise choice. We decided to get room service for 6:00 am. 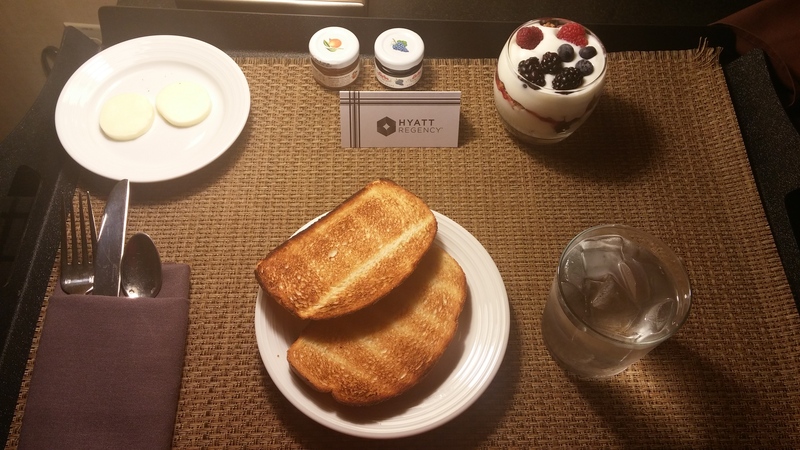 I am very adamant about having toast and jam before my races (pre-race superstition), so I had to order toast for $4, a $7 parfait for Bret, plus pay all of the additional “convenience” fees. Yes, it was worth it. By 7:00 we were in a cab heading to the race start. Stepping out into that wind was BRUTAL. There were tons of people crowding in wearing various layers of clothing, garbage bags and the like. I was wishing I hadn’t worn capris because the wind was pretty piercing! Bret didn’t even have a jacket on but didn’t seem phased. Me? Not so much. As I was deciding whether I wanted to wait in an extremely long porta-potty line (I declined), I heard my name called. And to my surprise, it was Chavuanne, an old classmate from high school! I haven’t seen her since she graduated! We both played alto saxophone in the jazz band. She was there to support her boyfriend running the race (what a trooper!). It was great to briefly catch up. 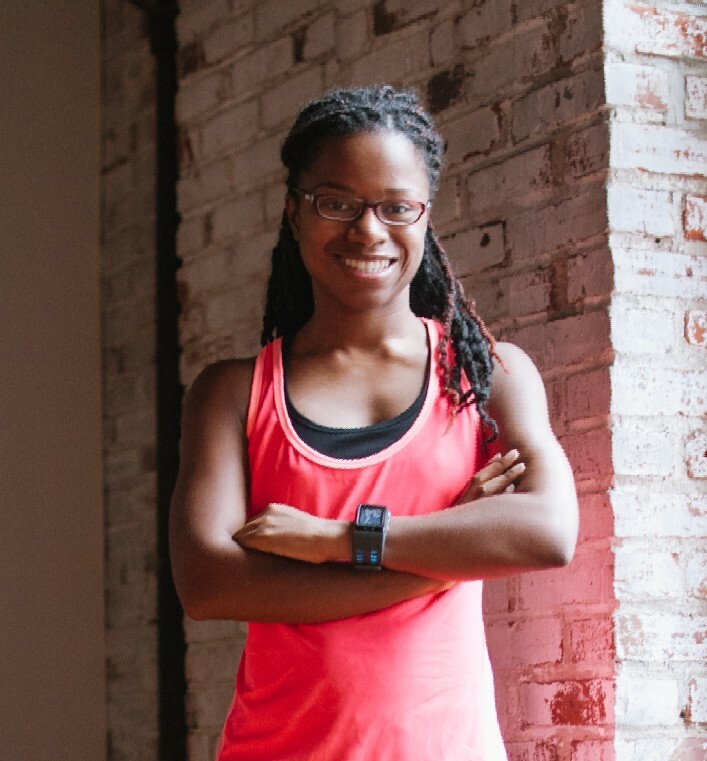 She’ll be running her first half marathon in Buffalo in May – so exciting! Chavuanne and me blowing in the wind! As always, before the race! Eventually, Bret took off towards the front since he’s way faster than I am. I had no idea how the corrals were set up because of the lack of signage. I didn’t really understand the wave system and just got in where I could fit in. Thankfully, this meant that I spent less time waiting to start than I usually do. Unfortunately, I didn’t get to meet up with Deborah who was also running the race. The wind was soul crushing and I did not want to lose the warmth (and wind-blocking) of the people around me! But pretty soon, it was time to take off! The race began and I wanted to make sure I didn’t start off too fast (I’m getting much better at this!). The good news was that I wasn’t packed in like a sardine with all of the other runners, like I was last year. This made it easy to keep a consistent pace. Since I ran the RNR DC a couple of weeks ago, the course was fresh in my mind. It was all a blur when we ran past the monuments at RNR, so this time, I wanted to make sure to take it all in. While there were no cherry blossoms to be found, it was still really beautiful. I took my first Clif Shotblok at mile 3. The wind was strong, but after a couple of miles, my body warmed up and I felt pretty comfortable. Sometime after mile 4 or 5, I removed my gloves and my hood. I really don’t like looking at my watch while running a race and usually rely on the mile clocks, but due to the circumstances I had no choice. I could tell that I was doing well and I felt GREAT. I didn’t want to think too much. Splits: 10:13, 10:38, 10:16, 10:02, 9:56. I just kept pushing. And my body was happy to oblige. There were more spots where the crowd was a bit much, but I tried to gracefully bob and weave without expending too much energy. Hains Point was long and a bit boring, but I had my music and I let the scenery and the people distract me. Once I got to mile 7, I knew that I was sooo close! And of course, the wind was getting even stronger, and not helping matters! Then I got to mile 9. Was it the longest mile? It felt like it, especially since there was no sign for the finish line! I could see the Washington monument so I knew that we’d be coming around the bend soon. I was so eager to finish and frustrated by being surrounded by people who were slowing down. But I ran up that hill and I finished with a huge smile on my face. I even got to see Bret cheering me on before the finish. I was actually extremely emotional and had to hold back tears of joy! Splits: 9:30, 9:25, 9:20, 9:11, 8:42. My official finish time was 1:38:04. My Nike+ watch had 1:38:11 in about 10.1 miles. I am extremely proud and happy with my performance! When I looked at my splits and saw how I improved each mile, it was a shock. I always knew that this happened to other people, but I didn’t think the day would come where my racing strategy would actually work! I couldn’t be happier. It was a little tough after the race to figure out how to get out of there, but Bret quickly found me after the finish. I walked the long path towards the exit, making sure to get a post-race photo. Eventually, I was handed bottled water and a granola bar. I had to figure out how to pick up my race medal from the volunteers, which was even more confusing with the lack of signs, but the process was pretty easy. Then I struggled to find my sister. This time, she was able to see me finish and even took video! (I’ll have to post it on IG). We also ran into our friends Pam and Brandy before heading out and gave high 5’s. Pam PR’d on the race, which is always great to hear! Bret, Jennifer, and I went to brunch at Scarlet Oak. It was a pretty cool spot and I was just thankful that we were able to get an easy reservation. 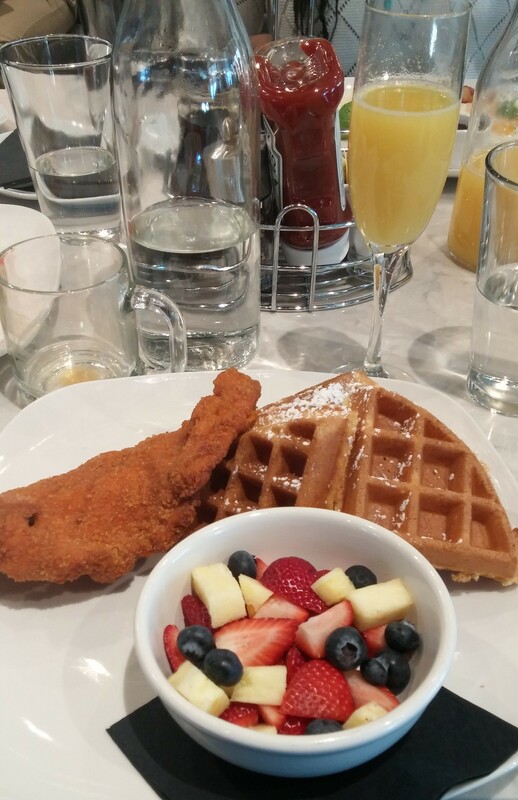 Of course, I had to get chicken and waffles and bottomless mimosas that I shared with my sister. I strategically drove us down to DC so that Bret could drive us back! Before I knew it, we were getting back in the car and heading back to Philly. I slept like a baby on that car ride! Mischief managed! Despite the windy weather, I had an incredible race at the Cherry Blossom 10 Miler! I don’t think there’s any way that we wouldn’t come back to run it again, it is such a great experience and really well-organized! Really nice course. While you’re not running all over DC, it’s a very nice course with great views of the monuments. Most people hate Hains Point but because I’m not a local, it didn’t bother me too much (though it is a bit boring). Great finisher’s T-shirt. I really liked the design for the T-shirts this year! I have the upgrade shirt and I can’t wait to wear it! They also have several items for sale online. Meb was at the race! It was very cool to be in the same room and the same course as such running royalty! Better crowd control. Yes, there were a few tight spots along the course, but I thought that I had plenty of space most of the time. This was much better than last year’s experience! Nice race expo. It’s probably well-known at this point that I’m not crazy about expos, but this one was really nice. Plus I got some free cheese. Great communication. For the second year in a row, the race organizers had to deal with an unexpected event and handled things very smoothly by sending emails and messages on social media. They made it look easy. No cherry blossoms this year. Last year I was spoiled by having the race during the peak bloom. It was still nice though! I’m not in love with the medal. Don’t get me wrong, it’s cute…I just thought it was such a nicer quality last year. I am so happy with the way this race turned out and I have so many people to thank! First, I have to thank the Credit Union Cherry Blossom organizers for selecting me as a Social Runner this year. It was an amazing experience and I really enjoyed being a part of the team. I really felt like a rock star with the wonderful hospitality and was proud to represent and promote this race! I also have to thank New Balance for the Virtual Training Program. It worked really well for me and while I didn’t run 5 days a week per the intermediate plan, I still did made the most of 4 days a week! I also received some New Balance swag for being a Social Runner (which I can’t wait to wear/show off) that is really nice! I’m so glad that my sister was once again able to be a support system! The weather was awful. But she was there, and we had a good time after the race. Of course, Bret was wonderful as always. While he was disappointed in his finish time of 1:21, we had a really fun weekend, though it was way too short! I really appreciate all of the spectators and volunteers who came out for this race. I was surprised to see that there was still a great turnout despite the cold and wind. It really makes a difference to see them out there! And last, thanks to everyone who gave me good vibes leading up to the race! Your confidence in me means a whole lot. I think I am finally getting back to where I was before my stress fracture. And not only am I running as fast as I did in 2012, I’m running much smarter! This is the beginning of a wonderful year of running! 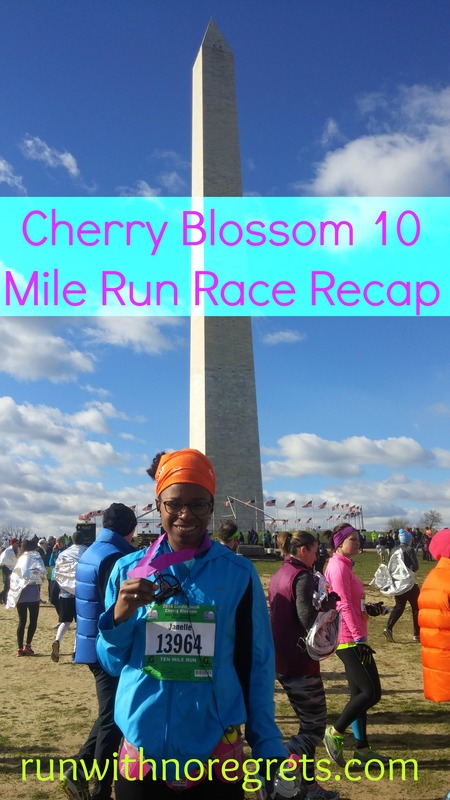 Did you run the Cherry Blossom 10 Miler this past weekend? 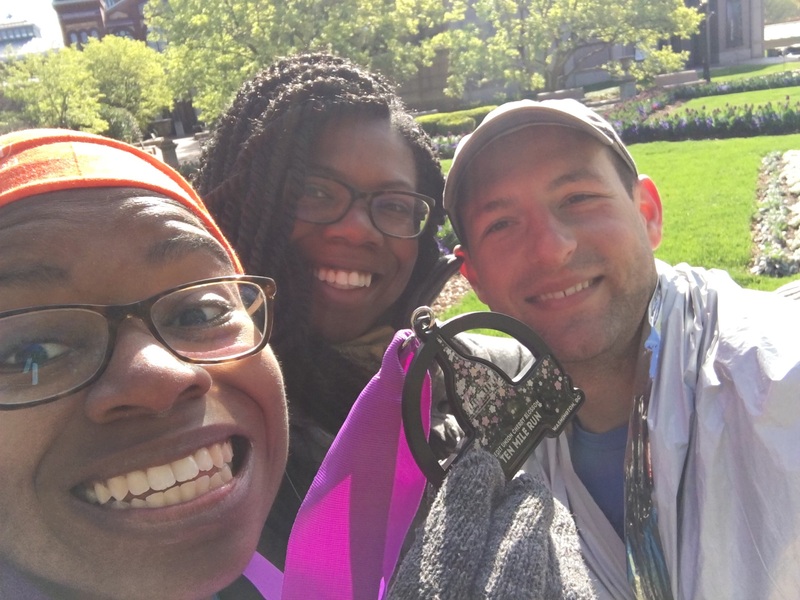 Share your recap in the linkup on the official Cherry Blossom Run blog! I’m also sharing this post with Julie from Running With a Skirt for the Best of the Blogs Linkup! 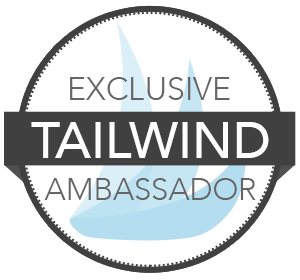 Have you ever run a race in the wind? Did it speed you up or slow you down?